Even though things look more of the same on the outside, with all white snow covered rooftops, hills and valleys, much has changed on the interior of our beloved Church. Winter months' weather has not stopped the wonderful work going on in the church! The paint removal/stripping process is 90% complete. They are currently working on the choir loft stairway and the sacristy and back hallway. The handicapped restroom is framed and the rough plumbing and electrical is in. The entire ceiling in the church is completed, the rebuild, the plaster, the paint and the decorative paint. It is gorgeous! The column bases, the chair rails and what was savable in woodwork trim is all being stripped and getting close to refinishing. All the mill work for the wains coating has arrived (handmade) to match and duplicate the original wood work. Soon to be installed. 90% of the scaffolding is removed. Some rolling scaffolding remains. The sub flooring of the church is being reinforced & repaired, readying for the delivery of the new maple flooring and tile. The pews have been built and are in storage awaiting to be delivered. The pew ends were replicated from our original. The pews are more comfortably ergonomically designed, with attached cushions and quiet kneelers. The choir loft floor has been reinforced and new PVC tile installed. The pipe organ has arrived and the installers have been here from Maine for over 2 weeks moving the console into choir loft as well as the blower both now installed. They are now assembling over 1,400 pipes for the wonderful sounds we soon will hear. All of the stained glass windows have been removed, cleaned, re leaded & grouted. 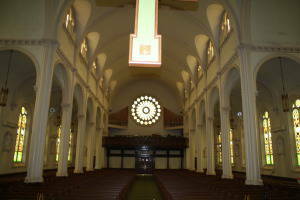 The remaining to be re installed are the sanctuary and one in the choir stairway. They are simply stunning with the light shining through, it feels like heaven making its way in. Our hanging pendant lights in the side aisles are now hanging, cleaned and rewired for more efficient use. All of the other electrical components have been installed, ceiling lights, spotlights, tower lights, a new fire detector system. All which will be more efficient. Although it has been a while in waiting for an update- it is not due to lack of goings on! We are getting closer- when Spring has sprung - so will we in our beloved church once again. We thank you for your patience, prayers and pride in our wonderful Parish of St. Mary.